A boy walking in a street in Bab Amr, Homs. Daniels and 3 other journalists were holed up for days is behind the building at right. Photo: Freedom House. This image is licensed under Creative Commons License. The lights are going off in Syria. Peter Kassig is only the most recent witness that succumbed to the darkness. David Haines, Steve Satloff and James Foley went before him. They had all gone there to assist and bear witness. A measure of the Islamic State’s (IS) monstrosity is the nobility of the people it has killed. International media has rightly condemned these horrific murders. For IS murder is a political act. But is also a performance–a spectacle as a means to amplify its message. The ritual act of murder, especially of a westerner, is certain to receive media coverage. IS uses this to rudely force attention. The emergence of IS has been a godsend for the regime. IS is the monster that the regime always claimed it was fighting. Ideologues who echoed and amplified this regime line over the years have proclaimed IS the true face of the opposition. Left unmentioned is the fact that until recently IS fought its biggest battles against the Syrian opposition. Indeed, earlier in the year, rebels had driven it out of Idlib, Deir Ezzor, much of Aleppo and areas around Damascus. It was only after its successes in Iraq and its newly acquired arsenal that it returned to Syria in triumph. But for many western ideologues, IS is part of an undifferentiated radical opposition to the secular regime of Bashar al Assad. In fact, IS has a lot more in common with the regime. It is a totalitarian force that uses terror as a means of control. The regime kills but is loath to take responsibility; IS revels in murder. The regime kills more, but IS better amplifies its acts. The regime’s audience is domestic; IS has transnational ambitions. Significantly, where IS proudly rejects the international order, the regime presents itself as its indispensable, if ruthless guardian. For the media, IS is a more exciting story. The media is selective elsewhere too. Foley and Satloff aren’t the only journalists IS has killed: there have been many more—Iraqis and Syrians—whose names remain unknown to the world. And IS isn’t the only force in Syria killing journalists and aid workers: Bashar al Assad’s regime has been doing it far longer. The Syrian nightmare has unfolded with such pace and intensity that each day’s horror displaces the one preceding it. With IS dominating the news it might be hard for audiences to remember that the killing of western journalists in Syria is as old as the conflict itself. It began long before any jihadi had alighted on Syrian soil. Years before anyone had heard the name IS, the regime killed Marie Colvin of theSunday Times along with the French photographer Rémi Ochlik when, in the first major escalation of the war, it used artillery on the Baba Amr district of Homs. A month before that it had killed Gilles Jacquier of France 2. Since the beginning, Damascus has tried to control the narrative by making it too dangerous for journalists to report from Syria—unless they embedded with the regime. Some have embraced this arrangement; unwilling to compromise their objectivity, others have accepted the perils of independent reporting. But most have stayed clear, relying instead on stringers, activists, or citizen journalists. Leaving aside the courage of the few who have risked much to report from outside regime-controlled Syria, reporting on the conflict has been gernally dismal. While some have used new technologies, including Skype, Youtube, Twitter, to gather material for reportage; others have forgone such exertions to deduce reality from pre-existing notions, ignoring the specificities of the situation in favour of ideological formulas that are impervious to time and place. With multiplying dangers and fewer reporters willing to enter the killing fields of Syria, it is the ideological types that have come to dominate reporting. This type has also found it easier to embed with the regime. They visit Syria not in search of stories but bring stories to Syria in search of validation. Beyond the ideological type, however, there is also the hack. If the ideological types are defined by their dogmas, the hacks are defined by procedures. All journalists aspire to be objective; and objectivity for most journalists is encoded in certain practices. To be objective is to be fair, impartial and balanced. But fairness and impartiality are harder to demonstrate; balance is measurable. For this reason, hack reporters use balance as an indicator of their objectivity. Balance is useful in many cases. But where there is a severe imbalance in the underlying situation, imposing balance distorts the picture. In Syria, the hack reporter’s need for balance has created a misleading picture of the conflict. One often hears the bien pensant liberal lament how “both sides” in the conflict are just as bad as the other. But “both sides” in the conflict are not equal. One side is a state with its hierarchies, chains of command and coercive apparatus intact; the other side is a diffuse, uncoordinated and disorganized opposition. The crimes of the former reflect policy; those of the latter only reflect on the group or individual perpetrating them. The regime’s crimes have been sustained and wholesale; the crimes of the opposition are retail and sporadic. That is not to excuse any crime. All criminals—rebel or regime—must face justice. But one must be wary of false notions of balance that undermine a sense of proportion. On September 11, 2013, Paulo Sérgio Pinheiro, special investigator for the UN Human Rights Council, concluded that before the August 2013 chemical massacre, the Assad regime had perpetrated at least eight major massacres while the rebels had been responsible for one. The rise and extreme brutality of IS hasn’t changed this equation. 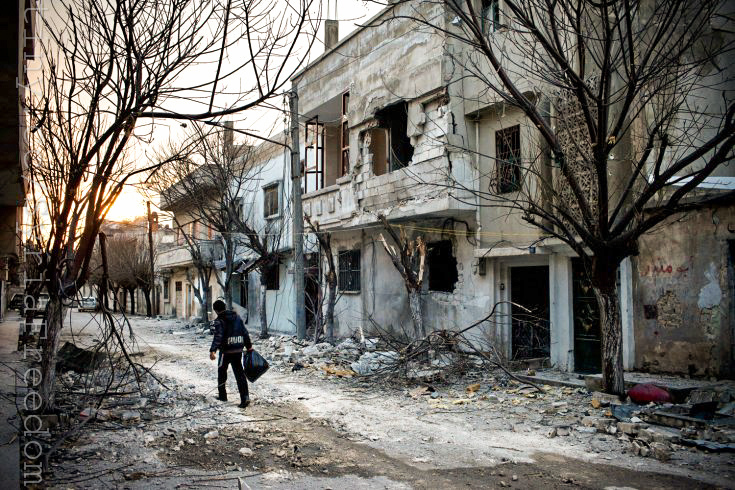 In a report concluded a year later, Pineheiro noted that the despite IS’s extreme violence, the Assad regime “remains responsible for the majority of the civilian casualties, killing and maiming scores of civilians daily”. This isn’t all that surprising if one considers that the Assad regime has a monopoly on airpower, armour, heavy artillery, ballistic missiles, and unconventional weapons—and it hasn’t hesitated to use them against civilians. But monstrous as the regime’s actions are, it has always managed to find people willing to give it the benefit of doubts. Refracted through ideology, each of the regime’s ruthless acts of repression becomes a strike against western imperialism or Islamic fundamentalism (the contradictions between the two notwithstanding). This is achieved by zooming out from actual events to an imagined context: Assad is not at war with his own people, we are made to understand, but against the proxies of an imperial force trying to undermine the “axis of resistance” of which he is a part. After using the benign “introduction” to describe a major escalation, Glass immediately retreats into the passive voice with “alleged to have been used” which doesn’t require him to identify the alleger. The UN and OPCW have alleged no such thing. The regime perhaps? But things get worse: Glass next tells us that the attack “unexpectedly led to hope for a way out”, because the Russians compelled Assad to give up his chemical arsenal. Glass then goes on to laud Russian which “delivered President Assad” at Geneva, but condemns the US for being “slow to persuade the militias it funds” along with its allies. By this reckoning when the Syrian regime uses chemical weapons against its people, it is delivering hope; the real aggressor, it turns out, is the US. Glass is not even the worst of them. The Independent’s celebrated foreign correspondent Robert Fisk, who has also chosen to embed with the regime,reported shortly after the chemical attack, that “information is now circulating in the city”—furnished by the Russians and corroborated by “a former Special Forces officer” operating with the Syrian Army’s 4th Division, who is “considered a reliable source” (by whom? )—that Assad wasn’t responsible for the attack. Fisk’s reliable source—the regime—tells him that it was indeed the rebels that were responsible for the attack. Fisk’s credulity is matched by his ethics. In August 2012, after a massacre in Daraya had left between 400-500 people, Fisk rode a Syrian Army armoured personnel carrier into the city to interview survivors and concluded that it was “armed insurgents rather than Syrian troops” that were responsible for the massacre. It somehow did not occur to this veteran journalist that people might not be very forthcoming being interviewed by a journalist “in the company of armed Syrian forces”. Indeed, Human Rights Watch came to very different conclusions after its investigation into the massacre. And when the veteran war correspondentJanine di Giovanni visited the town unaccompanied by regime troops, she received detailed testimony on how the Syrian military had carried out the massacre. Patrick Cockburn, Fisk’s colleague at The Independent, is another veteran correspondent, a winner of many awards. His book, The Jihadi’s Return, is enjoying great success. For Cockburn, IS has little to do with the Syrian regime; it is a by-product of the West and its Gulf allies’s decision to support an uprising against Assad. Cockburn finds it absurd that the West should try to strengthen the Iraqi government against IS while simultaneously trying to weaken the Syrian one. For Cockburn the Syrian regime is the only force capable of confronting IS. More controversially, he has portrayed the Free Syria Army as being in cahoots with IS, attributing this incendiary claim to an “intelligence officer from a Middle Eastern country neighbouring Syria”. (Note that this is the only instance in which Cockburn doesn’t reveal the name of the country. His most frequent source is the intelligence service of Iraq—Assad’s closest ally). Cockburn’s problems go beyond sourcing. Like Fisk, he also takes liberties with facts. If he witnessed this, then it would be major scoop. Since other than the regime, the only source to make this claim was the Russian state broadcaster RT. However, RT had used fake pictures to support its claim. Human Rights Watch and Amnesty International have found no evidence of this alleged massacre. However, when one looks at Cockburn’s original report on the incident in his January 28, 2014 column for The Independent, he attributes the story about rebels arriving through drainage pipes to “a Syrian soldier, who gave his name as Abu Ali”. In that version, Cockburn wasn’t a witness. There is a growing body of evidence from numerous sources in the Middle East — mostly affiliated with the Syrian opposition and its supporters — providing a strong circumstantial case that the August 21 chemical incident was a pre-planned provocation by the Syrian opposition and its Saudi and Turkish supporters. There is a growing volume of new evidence from numerous sources in the Middle East — mostly affiliated with the Syrian opposition and its sponsors and supporters — which makes a very strong case, based on solid circumstantial evidence, that the August 21, 2013, chemical strike in the Damascus suburbs was indeed a pre-meditated provocation by the Syrian opposition. The intelligence officials had plagiarized. Their claim was the figment of a conspiracist’s imagination. Syria has been a deadly conflict for journalists – it has claimed the lives of 70 so far. Few journalists are willing to venture there any longer—except as guests of the regime. Those who have made this compromise in turn have acquired influence despite the compromised nature of the journalism that they are producing. In turn they are shaping public opinion and even policy. We have to be wary of those who see Syria as an opportunity to settle old ideological scores.